Yes, toenail fungus is contagious. You have to catch it from somewhere – while it might seem like it just appeared on its own out of nowhere, if you’ve got toenail fungus then you’ve come into contact with someone else who is infected. While it might not be classified as “highly contagious”, it is still very easy to spread a fungal toenail infection from one person to another, typically through sharing items that have come into contact with the infection – think shoes, socks, nail polish, nail tools, etc. In terms of spreading the fungal infection from one person to another, one of the most common places for an infection to spread is at a nail salon. If a person who has a fungal infection has a nail treatment and the tools are not properly sterilised between treatments, or a bottle of nail polish is used on an infected person, it can easily be spread to other patrons at the salon. If you regularly go for pedicures, be sure to ask about their sterilisation techniques and practices – and take your own nail polish. However, this is not the most common way of catching a toenail fungus – mainly because toenail fungus is much more common in men than it is in women. For most people, the fungus that has infected their toenails started off as a case of athlete’s foot. This is typically spread from person to person by walking barefoot in the showers at your gym or at your local swimming pool, which is why you should always wear flip flops or sandals when in any damp/wet area. Left untreated, this case of athlete’s foot will continue to grow and spread across the sole of your feet and onto your toes – and this is when it will typically “jump” and infect your toenails. Normally, this is the result of some kind of trauma to the nail that will make it susceptible to the infection – such as when someone steps or drops something on your toes, or it could be the repetitive trauma on your toenails from wearing shoes that don’t fit properly. People who play certain sports like basketball, tennis, racquet ball or netball are often more susceptible to a fungal toenail infection because of the sudden stopping movements that cause the foot to slide inside the shoe. The toenail fungus might first appear as a small patch of discoloration on one of your toe nails, typically white or yellow. Many people might even just think that it is a scratch or mark and ignore it, until it has truly had a chance to take hold of your nail, and turn it into an unsightly, thickened yellow/white brittle mess. Once you have one infected toenail, it is a lot more likely to spread from one toenail to another on the same foot or even jump to your other foot, being spread by everyday items like your socks. Just washing your socks isn’t enough to help prevent this – you need to do something in order to kill the bacteria or fungus. This could include soaking your socks in eucalyptus oil or bleach before washing, or switch to using an anti-fungal & anti-bacterial washing powder. As soon as you notice the first signs of a fungal toenail infection, you should treat it to avoid further infecting either yourself or other members of your household. On my blog, I have a range of different home remedies that you can try, as well as information about the most trusted ways that you can treat toenail fungus. Having had toenail fungus for almost ten years, I tried many different treatments and my experience with them are detailed on the home page including prescription medications that have damaging side effects on your liver and other organs, and laser treatment. 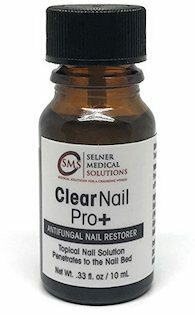 After trying several of the home remedies that I found online, a topical anti-fungal product called Loceryl and even undergoing several sessions of laser treatment, the one product that I found that was actually able to cure my toenail fungus was ClearNail Pro+ – I highly recommend that you check it out if you have toenail fungus. Click here to learn more about ClearNail Pro+ and buy online. My husband has toe nails fungus pretty bad. Can it be contagious through intimate contact? What about making children? While “intimate contact” itself is unlikely to transmit toenail fungus, things such as sharing the same shower/bathroom and sometimes even sharing the same bed sheets can be enough to lead to transmission of toenail fungus from one person to another. Work on getting your husband’s toenail fungus treated, and if you start to see signs on it on your own feet, treat it immediately – the sooner you begin treatment, the less likely it is to take hold. The longer it’s been around, the harder it becomes to treat. I have nail fungus on 8 toenails. I am wondering if, when I wear stockings, the fungus remains on the stockings. I cannot wash the stockings in hot water or they will be ruined. They are expensive medical stockings. What do you recommend? You could try washing in various essential oils, such as tea tree oil or eucalyptus oil, both of which could help kill any spores that are living in the stockings. Do you have a formula for washing with tea tree oil? Some many drops per quart? What about cleaning a foot spa after a person w toe nail fungus used? Would you recommend making a spray with tea tree oil to spray the inside of the foot spa or soaking?